Rick "CJ" Struckow commands Discovery for the 13-day, STS-128 mission to the International Space Station (ISS) with Kevin Ford as his pilot. Joining them are mission specialists Pat Forrester, Danny Olivas, José Hernández and flying on behalf of the European Space Agency (ESA), Christer Fuglesang. STS-128 will deliver Nicole Stott to the station as a flight engineer and return NASA astronaut Tim Kopra to Earth, completing the last ISS crew rotation by shuttle. Discovery is carrying the Leonardo Multi-Purpose Logistics Module, a pressurized "moving van" that will be temporarily installed on the station. The module will deliver science and storage racks, a freezer to store research samples, a new sleeping compartment, and the Combined Operational Load Bearing External Resistance Treadmill, or COLBERT. The mission will include three spacewalks to replace experiments outside ESA's Columbus laboratory, and install an ammonia coolant storage tank. The STS-128 crew pauses before departing for Discovery on the launch pad. Do you have comments and/or questions about the STS-128 mission? Post to our mission viewing and commentary thread. For prior status updates about readying STS-128 see Discovery to loft Leonardo. Space shuttle Discovery lifted off from Kennedy Space Center's Pad 39A at 11:59 p.m. EDT on Friday, less than two days before the 25th anniversary of its maiden launch. Thunderstorms during the countdown threatened to delay the start of the flight, with several lightning strikes within five miles of the launch pad, but they abated in time for the successful liftoff. The weather thwarted Discovery's first launch attempt on Tuesday, which was followed closely by a liquid hydrogen fuel valve glitch that prevented a second try. The fill and drain valve is a critical component in Discovery's main propulsion system, but worked without problem during the shuttle's midnight launch Friday. "This time Mother Nature is cooperating, so it looks like the third time really is the charm," NASA launch director Pete Nickolenko told the crew just before liftoff. 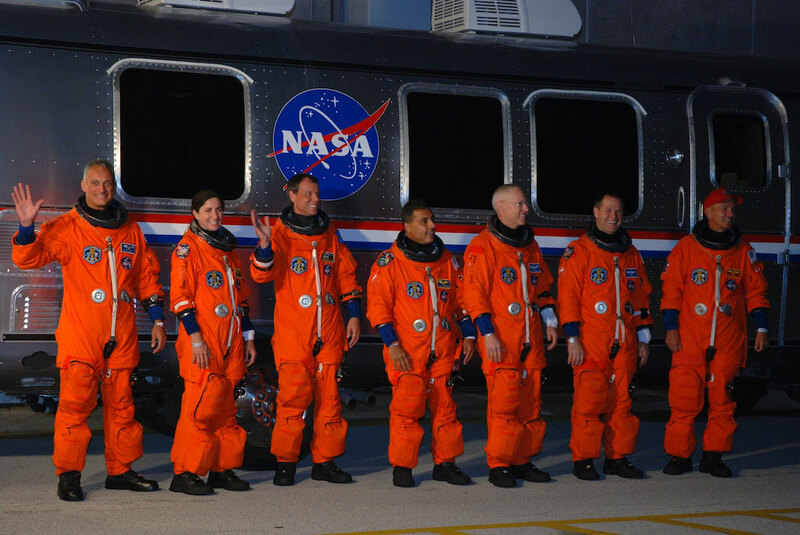 "Thanks to everyone who helped prepare for this mission," STS-128 commander Rick Sturckow replied. "Let's go step up the science on the International Space Station." Friday's launch marked the 30th space shuttle flight to depart for the International Space Station. 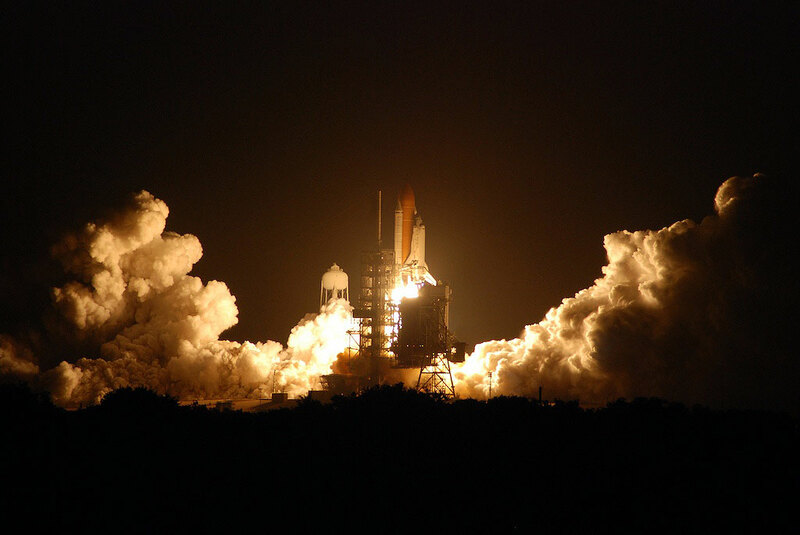 It is Discovery's 37th flight and NASA's 33rd shuttle mission to launch at night. Shortly after reaching space, the STS-128 crew began procedures to ensure Discovery was healthy for on-orbit operations and opened the payload bay doors. The crew's launch day ended with a thorough checkout of Discovery's robotic arm and a survey of the payload bay before they headed to bed at about 5:30 a.m. CDT on Saturday. 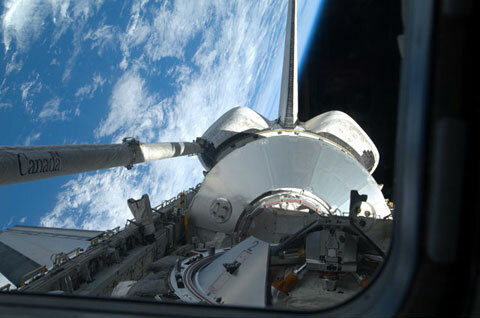 The crew of space shuttle Discovery woke at 1:30 p.m. CDT to start work on the first full day of their 13-day mission. Overnight, NASA's flight control team reported the failure of one of two small steering jets that flank the orbiter's nose due to a leak. This will have no impact to docking, other mission activities or entry, but the crew was instructed to close a manifold to isolate both jets and disable them from use for the remainder of the mission. The song "Back in the Saddle Again" by Gene Autry, was played as the wake-up music for shuttle commander Rick Sturckow. "It's great to be back in space and we're looking forward to a great flight day two," radioed Sturckow. Sturckow, joined by pilot Kevin Ford, began the day by firing Discovery's right orbital maneuvering system (OMS) engine for 16 seconds to refine the orbiter's path toward the International Space Station. Ford, with mission specialists Pat Forrester and Jose Hernandez then began the survey of Discovery's heat shield. Using the robotic arm and specialized cameras at the end of an extension boom, they commenced with a well-established choreography to capture detailed video of the orbiter's wing leading edges and nose cap. The imagery will be reviewed by specialists to ensure there was no damage from liftoff. Their crewmates Danny Olivas, Christer Fuglesang and Nicole Stott were meanwhile performing a check out of the spacesuits they will wear during STS-128's three spacewalks and prepared them to be transferred to the station. Later in the day, the crew will set up the centerline camera, extend the Orbiter Docking System ring and check out other equipment that will be used during tomorrow's approach and docking to the space station. Docking preparations occupied the end of Discovery crew's workday, their first full day in space. The astronauts tested equipment to be used Sunday for rendezvous operations with the International Space Station. Mission specialists Pat Forrester and Christer Fuglesang installed the Orbiter Docking System centerline camera and extended the outer ring on the docking system. 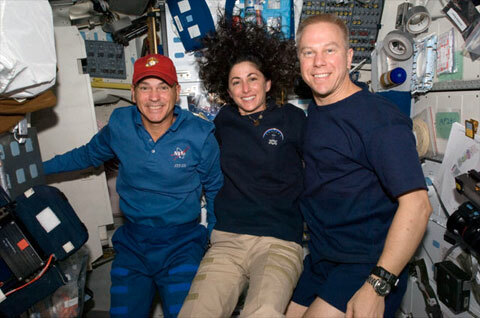 The STS-128 crew began their eight-hour sleep period at 4:29 a.m. CDT on Sunday. Discovery's astronauts woke at 12:30 p.m. CDT with "Made To Love" performed by Toby Mac played for STS-128 mission specialist and soon-to-be space station flight engineer Nicole Stott. "Thank you so much for playing that song," radioed Stott, who will be the first mom to take up residency on the ISS. "And a special thanks to my son, Roman, for selecting that." "'Ginormous' thanks to him and big space hugs. That's one of our very special ones. And just want to let him know I love him more than anything." Discovery's crew are focusing on preparations for the rendezvous and docking to the station, set for 8:03 p.m. Commander Rick Sturckow and pilot Kevin Ford will perform a few final corrective jet firings to refine the orbiter's path to poise them for the rendezvous pitch maneuver (RPM) -- a backflip -- under the station at 7 p.m. Guided in by STS-128 commander Rick "CJ" Sturckow and his crew of six, Discovery docked with the International Space Station at 7:54 p.m. CDT on Sunday, just over a half day and quarter century after the orbiter's first launch at 7:41 a.m. on August 30, 1984. "Capture confirmed," reported Pat Forrester to Mission Control and the station's crew. The shuttle's and station's crews will open hatches between the two spacecraft at 9:59 p.m. and conduct a welcoming ceremony before beginning eight days of joint operations. Before docking, Sturckow began at 7:03 p.m. the rendezvous pitch maneuver, guiding Discovery through a nine-minute back flip while station crew members Gennady Padalka and Mike Barratt captured imagery of the shuttle's heat shield. Taken from a distance of about 600 feet, their high-resolution photos will be downlinked to Mission Control, where experts will use them to evaluate the condition of Discovery's thermal protection system. For only the second time in history, 13 people have assembled on one spacecraft to begin eight days of joint space operations. Hatches separating the crews on-board space shuttle Discovery and the International Space Station were opened at 9:33 p.m CDT. At 10:49 p.m., Discovery mission specialist Nicole Stott and station flight engineer Tim Kopra exchanged Soyuz seat liners and titles, as Stott became a member of the ISS Expedition 20 crew and Kopra an STS-128 mission specialist. Before retiring for the day at 4:30 a.m. CDT, STS-128 astronauts Kevin Ford, Tim Kopra, Jose Hernandez and Pat Forrester used the station's robotic arm to remove Discovery's extension boom from its position on the payload bay sill to hand it off to the shuttle's arm, providing additional clearance for the removal of the Leonardo Multi-Purpose Logistics Module on Monday. The crew members also started transferring supplies from Discovery's middeck to the station, beginning with the relocation of the spacesuits to be used for the mission's three planned spacewalks. The combined crews of space shuttle Discovery and the International Space Station awoke at 12:30 p.m. CDT to start the first of eight days of joint operations. The shuttle crew's wake-up song was "Mi Tierra" by Gloria Estefan, selected for mission specialist Jose Hernandez. "A special good morning to everybody who's listening to us," radioed Hernandez. "I want to give a special thanks to my wife, my family and friends who suggested this song." "I'm just happy to be able to share my experiences over my Twitter account, a special thanks to those who are following along. Just happy to be here and continuing on with our mission." Pilot Kevin Ford and Expedition 20 flight engineer Mike Barratt will use the station's robotic arm to move the Leonardo Multi-Purpose Logistics Module (MPLM) from Discovery's payload bay to the Earth-facing port on the station's Harmony module. They are expected to start the nearly three-hour maneuver just after 2:30 p.m. Christer Fuglesang of the European Space Agency and Tim Kopra will assist with the attachment and activation activities. After leak checks and pressurization, the astronauts are expected to open the hatches to the cargo module at 12:34 a.m. on Tuesday. The transfer and installation of the Leonardo Multi-Purpose Logistics Module (MPLM) from Discovery's payload bay to the Earth-facing port on the station's Harmony module was completed at 4:56 p.m. CDT. Working ahead of their time line, the crew on the International Space Station opened the hatch leading into the Leonardo Multi-Purpose Logistics Module at 10:54 p.m. CDT. Leonardo is carrying 7.5 tons of supplies including: two research racks (Fluid Integrated Rack and Materials Science Research Rack), a new station crew quarters, the Minus Eighty-Degree Laboratory Freezer for ISS (MELFI-2), the Air Revitalization System Rack and the COLBERT treadmill. After opening the hatch leading into Leonardo, the astronauts aboard the International Space Station spent the rest of their fourth flight day preparing the pressurized cargo module for the transfer work they will perform over the next six days. The shuttle and station crews also began transferring cargo brought up inside Discovery's middeck. The STS-128 spacewalkers -- mission specialists Danny Olivas and Jose Hernandez, and flight engineer Nicole Stott -- worked to move their tools into the station's airlock. 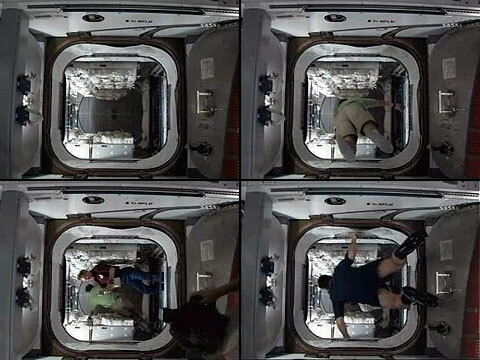 Olivas and Stott then spent the night inside the Quest airlock, which was adjusted to a lower air pressure to prepare them for working in the vacuum of space. Part of a "pre-breathe protocol," the reduced atmosphere helps force nitrogen out of their blood stream, which protects them from getting decompression sickness, also known as the bends. Discovery's crew went to sleep just before 4 a.m. CDT on Tuesday. The STS-128 crew will spend their fifth flight day unpacking the Leonardo Multi-Purpose Logistics Module and performing the first of the mission's three planned spacewalks. The astronauts awoke at 11:59 a.m. CDT to the song "Indiana Our Indiana" by the Indiana University Band, played for pilot Kevin Ford. "That song reminds me of my wonderful home state of Indiana," radioed Ford. "It also reminds me of my oldest brother David, who was the first person to strap me into the cockpit of an airplane. Thank you David and thank you Houston." 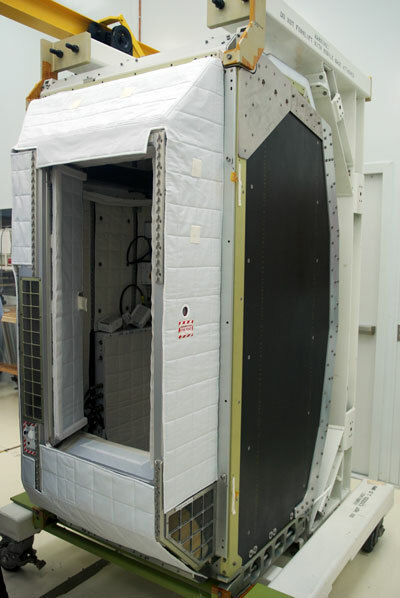 Crew members will move three racks of equipment from cargo carrier onto the station, including the Combined Operational Load Bearing External Resistance Treadmill, or COLBERT. The exercise device will be stowed temporarily in the Harmony node until it can be moved into Tranquility, which is slated to arrive early next year. Mission specialist Danny Olivas and flight engineer Nicole Stott are set to start the mission's first spacewalk at 4:49 p.m. to begin the task of replacing a mostly empty ammonia coolant tank. They will also be retrieving two science experiments that have been attached to the exterior of the Columbus laboratory to return them to Earth. Taking their spacesuits to internal power, Danny Olivas and Nicole Stott began the first spacewalk of the STS-128 mission at 4:49 p.m. CDT. Their extravehicular activity (EVA) is expected to take six hours and 30 minutes. Olivas, as the lead spacewalker with two prior EVAs to his credit, is wearing the spacesuit marked with solid red stripes. Stott, making her first spacewalk, donned a suit with broken red stripes. The two spacewalkers will begin the replacement of an ammonia tank assembly (ATA) on the first port (P1) segment of the station's truss. Olivas and Stott will remove the 57 inch long by 80 inch wide by 45 inch tall depleted tank from the truss, so that it may be picked up by the station's robotic arm for storage until after the second spacewalk. The ATA is used to provide cooling for the thermal control system in the truss. Ammonia in the tank flows into the truss' pump module assembly, which is the heart of the thermal control system. The tank assembly being removed still contains about 200 pounds of ammonia and weighs 1,295 pounds. To remove it from the station's truss, Olivas and Stott will disconnect two lines used to transfer its ammonia, two lines which provide nitrogen for pressurization, and two electrical connections and release four bolts. They'll then work together to lift the tank away from the truss and maneuver it into position for the robotic arm to latch onto. While the arm is still holding the tank assembly, Stott will install a foot restraint, which she'll then climb into for the removal of the European Technology Exposure Facility, or EuTEF. While Stott gets into place, Olivas will document the experiment's condition by taking some photographs. Olivas will then detach the experiment by releasing one bolt, and Stott will lift it away from its place on the Columbus laboratory. From there, Kevin Ford and Bob Thirsk will drive Stott via the robotic arm to the shuttle's cargo bay, where she'll work with Olivas to store it on a cargo carrier for transport back to Earth. One bolt will be used to attach it to the carrier. While he waits for Stott, Olivas will close the containers in which the two parts of the MISSE experiment are housed, and disconnect two cables. Olivas will then remove the first of the containers and pass it on to Stott for installation in a storage location. The second will be removed and stowed by Olivas. Danny Olivas and Nicole Stott reentered and began repressurizing the International Space Station's Quest airlock at 11:24 p.m. CDT, having successfully completed the STS-128 mission's first of three planned spacewalks in 6 hours and 35 minutes. The 131st spacewalk in support of ISS assembly and maintenance (totaling 817 hours, 11 minutes), Olivas and Stott removed a depleted ammonia tank from the station's P1 truss and stowed a European experiment pallet and two U.S. experiment containers for their return to Earth inside Discovery's payload bay. The outing proceeded mostly on schedule, allowing the astronauts the time to attempt (but not complete) a couple of "get-ahead" tasks, although there were a few moments that gave them pause. About an hour into the spacewalk, flight controllers took a short time to evaluate a possible fray on Olivas' right spacesuit glove's index finger. The team looked at preflight photographs of the glove and determined it was in the same condition as it was when it passed preflight inspections, clearing Olivas to proceed with the EVA. An unexpected communications outage resulted in a few of the astronauts' tasks being rearranged. 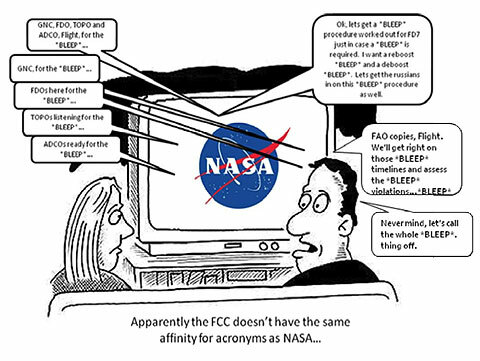 A storm over Guam prevented communications from being relayed between a Tracking and Data Relay System Satellite (TDRSS) and the shuttle and station. The loss of signal (LOS) lasted 33 minutes. Stott also ran into some problems bolting the European Technology Exposure Facility, or EuTEF, to its carrier inside Discovery's payload bay. The bolt needed to be tightened with 11 turns but it would only turn twice; ultimately, she and Olivas were able to get it secured. Before coming back in, Olivas reported seeing several micrometeroid impacts to the airlock. Although of no danger to the integrity of the station, their sharp edges could cause tears in astronauts' spacesuits. Olivas photographed the impacts for later analysis. This was Stott's first spacewalk and Olivas' third, giving him a career total of 20 hours and 48 minutes working in the vacuum of space. As Danny Olivas and Nicole Stott were performing the mission's first spacewalk, commander Rick "CJ" Sturckow and mission specialist Pat Forrester guided the spacewalkers through their procedures while pilot Kevin Ford and flight engineer Bob Thirsk operated the station's robotic arm. Meanwhile, mission specialists Jose Hernandez, Christer Fuglesang and Tim Kopra, together with flight engineer Mike Barratt, continued unloading the Leonardo Multi-Purpose Logistics Module, transferring an air revitalization system, a new crew quarters compartment and a treadmill. The latter, dubbed the Combined Operational Load Bearing External Resistance Treadmill (COLBERT), was named after Stephen Colbert, of Comedy Central's "The Colbert Report," took an interest in a recent NASA naming poll and urged his followers to post the name "Colbert." The treadmill, which will be assembled later this month, is the second on the station. The crew were due to go to sleep at 3:29 a.m. CDT on Wednesday. The 13 members of the combined shuttle and space station crew will install science equipment and racks today, enhancing the research capabilities for the orbiting laboratory. The crew began Flight Day 6 at 11:30 a.m. CDT to the song "What a Wonderful World" as performed by Louis Armstrong and played for European Space Agency astronaut Christer Fuglesang. "Good morning, and thanks for that wonderful music," replied Fuglesang. "And a wonderful day around this wonderful world." The crew will continue today to transfer supplies between Discovery and the station, as well as install experiment racks from inside the berthed Leonardo Multi-Purpose Logistics Module. STS-128 commander Rick Sturckow, pilot Kevin Ford and mission specialists Pat Forrester, Jose Hernandez and Fuglesang, as well as ISS Expedition 20 commander Gennady Padalka and flight engineer Frank De Winne, will all play a part in the transfer and installation of the new hardware. The Fluids Integrated Rack, Materials Science Research Rack-1 and the Minus Eighty-Degree Laboratory Freezer for ISS will be added to the U.S. Destiny laboratory. Expedition 20 flight engineer Mike Barratt will work on installation and outfitting of the new crew quarters compartment that was transferred, providing a new private space for fellow crewmate Bob Thirsk. Thirsk meanwhile will focus on the ongoing transfer of food and supplies from the Leonardo module. New Expedition crewmember Nicole Stott will continue with station orientation and later join De Winne for two hours of training related to the upcoming arrival of Japan's H-II Transfer Vehicle, set to launch on September 10. Roscosmos flight engineer Roman Romanenko will continue with ISS maintenance tasks. Mission specialist Danny Olivas and Hernandez will participate in two media events. They will talk with CNN Espanol, Televisa Mexico and KCRA-TV at 5:24 p.m. and then later, at 8:55 p.m., they will respond to public questions submitted via Twitter and YouTube. Olivas and Fuglesang will also work on preparing for their spacewalk tomorrow, getting their suits in place in the Quest airlock, gathering tools and join their crewmates to review the spacewalk plan. A wayward segment of a European-launched Ariane 5 rocket that is projected to come within 6 miles (10 km) of the International Space Station on Friday may require the STS-128 and ISS Expedition crews to take action, possibly delaying their second spacewalk by a day. "We've been analyzing whether we need to do debris avoidance maneuver [DAM]," capcom Tony Antonelli told Discovery's commander Rick "CJ" Sturckow from Mission Control. "We're considering all the options and they're all still on the table." Among the actions being considered are to perform an attitude maneuver, boosting the station's orbit after tomorrow's spacewalk is over, or a de-boost maneuver that would result in delaying Danny Olivas' and Christer Fuglesang's scheduled outing on Thursday and extend the STS-128 mission by an additional day. Flight controllers could also decide that the debris is not a threat and therefore do nothing. The rocket part, of unknown dimensions, is in a highly elliptical orbit, 32,000 by 317 kilometers. Its closest point of approach to the station is expected at 10:06 a.m. CDT on Friday. Since no DAM decision has been made, preparations will continue to conduct the second spacewalk on Thursday. Update: Flight controllers have informed the crew in space that they have decided against a de-boost maneuver and as such tomorrow's spacewalk will proceed as scheduled. If a DAM is needed, it will be a reboost after the spacewalk is complete. Update: Based on further analysis, flight controllers have concluded that a Debris Avoidance Maneuver (DAM) would not be necessary. STS-128 mission specialists Danny Olivas and Christer Fuglesang will camp out in the Quest airlock overnight to acclimate for their spacewalk on Thursday to replace an ammonia tank assembly used to regulate the International Space Station's temperature. Olivas and Jose Hernandez were interviewed by reporters with CNN Espanol, Televisa Mexico and KCRA-TV, and answered questions submitted by the public via Twitter and YouTube. The crew retired for the day, their sixth in space, at 3:30 a.m. CDT on Thursday. Two astronauts will venture back into the vacuum of space today for the second of three planned spacewalks for the STS-128 mission. Danny Olivas and Christer Fuglesang will install a new ammonia tank on the International Space Station and stow a depleted tank for its return to Earth. The spacewalkers were awakened with the rest of their crewmates at 11:30 a.m. CDT to the wake-up song "There is a God" by 33 Miles, played for mission specialist Pat Forrester. "We certainly have a beautiful view of the Earth and of the heavens up here," replied Forrester. Forrester will serve as the intravehicular officer (IV) throughout the 6.5 hour spacewalk, which is scheduled to begin at 4:19 p.m. but may commence early. Meanwhile, back on Earth, the solid rocket boosters that launched Discovery have been retrieved from the ocean and have arrived back at port. NASA TV aired footage today of the launch captured from the viewpoint of the boosters' cameras. 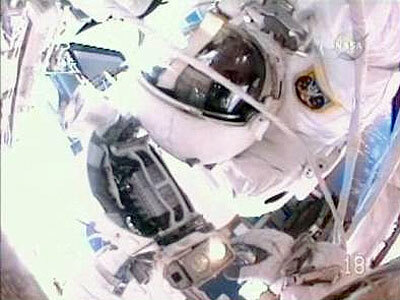 Danny Olivas and Christer Fuglesang began the second of three spacewalks for the STS-128 mission at 5:12 p.m. CDT. The start of their extravehicular activity (EVA) was delayed by nearly an hour due to configuration issues with Olivas' and Fuglesang's communications, or Snoopy caps. The 6.5 hour spacewalk will focus on completing the replacement of an ammonia tank assembly, which began during the mission's first excursion by Olivas and Nicole Stott on Flight Day 5. Olivas will begin by removing insulation on the new ammonia tank while Fuglesang gets into position at the end of the station's robotic arm. He and Olivas will then work together to release the four bolts securing the tank to the cargo carrier inside Discovery's payload bay. Stott and Kevin Ford, working inside the ISS, will then drive the robotic arm -- carrying Fuglesang and both the new and old ammonia tanks -- to the installation site on the P1 truss segment. Olivas will meet Fuglesang there, and together they'll drive the four bolts that will hold the new tank in place. Olivas will then connect two electrical cables and four fluid lines. With the 57-inch long by 80-inch wide by 45-inch tall new tank assembly installed, Olivas and Fuglesang will prepare for the storage of the similarly sized old tank, still latched to the station's robotic arm. Olivas will tether the old tank assembly to himself and then give Ford and Stott the okay to command the robotic arm to release it. Fuglesang will then attach his tether to the assembly and Olivas will remove his, allowing Fuglesang and the old tank to make their way back to Discovery's cargo bay riding the arm. Once there, Olivas and Fuglesang will install the old tank on the cargo carrier with four bolts. Olivas, making his fourth spacewalk (his second on this mission), is wearing a spacesuit marked with solid red stripes. Fuglesang, also making his fourth spacewalk -- the most ever by an astronaut of other nationality than American or Russian -- can be distinguished by a suit with no stripes. The International Space Station has about 600 pounds of fresh ammonia circulating through its port cooling system, thanks to the work today of spacewalkers Danny Olivas and Christer Fuglesang. Olivas and Fuglesang spent six hours and 39 minutes outside the space station during the second spacewalk of the STS-128 mission, primarily working to install a new ammonia tank assembly, which pushes the coolant through loops on the station's truss to get rid of excess heat generated by the station's systems. The spacewalk ended at 11:51 p.m. CDT. In addition, the spacewalkers prepared the spent tank assembly that was removed during the mission's first spacewalk for return to Earth by bolting it down inside the Discovery's payload bay. By that point in the spacewalk, Olivas and Fuglesang were ahead of their timeline, and so were able to move into get-ahead work. 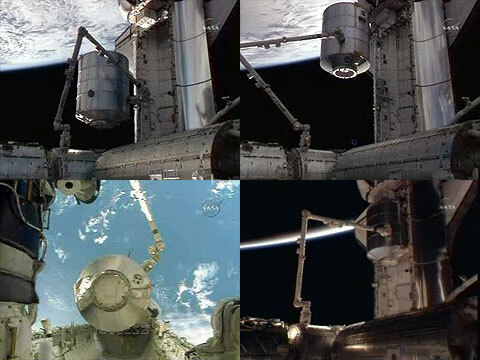 They installed protective lens covers on the cameras of the station's robotic arm, which will shield them from contamination when the arm is used to dock the Japanese H-II Transfer Vehicle (HTV) to the station later this month. 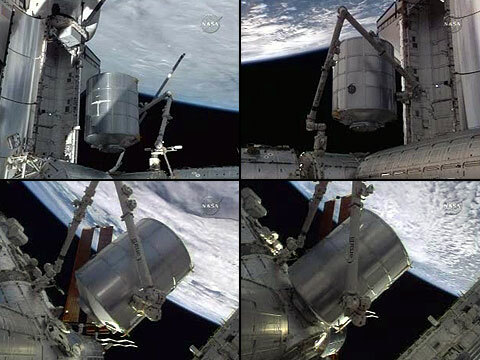 They also installed a portable foot restraint on the station's truss system for use during upcoming missions. As Danny Olivas and Christer Fuglesang worked outside to complete the STS-128 mission's second spacewalk, inside the space station, mission specialist Jose Hernandez and ISS flight engineers Mike Barratt, Frank De Winne and Bob Thirsk continued the work of unloading the Leonardo multi-purpose logistics module of the eight tons of cargo it carried into space and began re-filling it with items to be returned home. The astronauts have finished about half their transfer work prescribed by flight planners, and has until Monday to complete the remainder. 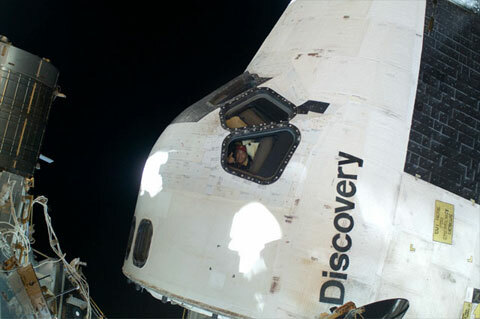 Discovery's crew went to go to sleep around 3:00 a.m. CDT. Mid-mission, the activities in space slow down a bit today while the space shuttle crew members have the morning off. They will join their International Space Station counterparts for work in the afternoon, continuing with transferring supplies and preparing for their third and final planned spacewalk of the mission. For the second time, the crew was awakened by the sound of Louis Armstrong singing "What a Wonderful World," this time played for mission specialist Danny Olivas. "Houston, Discovery, good morning," radioed Olivas. "And special good morning to my wife, Marie and the rest of my family, my kids. I love them, miss them and look to see them soon." STS-128 commander Rick Sturckow, pilot Kevin Ford and mission specialists Pat Forrester, Jose Hernandez, Christer Fuglesang, Tim Kopra and Olivas all have the morning off. ISS Expedition 20 commander Gennady Padalka and flight engineers Mike Barratt, Roman Romanenko, Bob Thirsk, Frank De Winne and Nicole Stott have some off-duty time scheduled and will continue station maintenance work. Stott, Thirsk and De Winne also have about two hours scheduled to study H-II Transfer Vehicle (HTV) procedures. Japan's HTV-1 is set to launch to the station September 10 and arrive a week later. All 13 crew members gathered for a midday meal, crew photo and news conference. At 7:54 p.m. CDT, they convened in the station to take questions from media in the United States, Canada and Sweden. After enjoying some free time and participating in a joint crew news conference, it was back to work for the STS-128 and ISS Expedition 20 astronauts, with more cargo transfer -- primarily packing up the emptied Leonardo multi-purpose logistics module with items to be sent home -- and preparing for the mission's third spacewalk. The space shuttle and International Space Station crews will turn their focus to the third and final spacewalk of the mission today. Inside the complex, transfer and maintenance will continue. 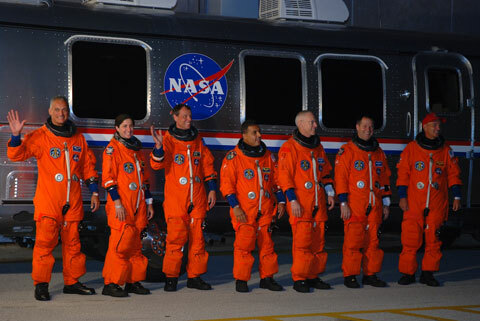 The crews arose at 11 a.m. CDT to "El Hijo del Pueblo" performed by Alfredo Jimenez, chosen by the family of STS-128 mission specialist Jose Hernandez. Hernandez will assist Danny Olivas and Christer Fuglesang as they prepare for their second spacewalk together, scheduled to begin at 3:49 p.m.
Danny Olivas and Christer Fuglesang began their second spacewalk together at 3:39 p.m. CDT. As they did on their prior extravehicular activity (EVA) on Flight Day 7, Olivas is wearing a spacesuit with red stripes and Fuglesang a suit with no stripes. The first tasks of the final spacewalk of the STS-128 mission will finish work left by the previous space shuttle mission. The STS-127 spacewalkers completed the deployment of the one cargo attachment system on the P1 truss segment, but had to leave the set up of similar systems on S3 for future missions. 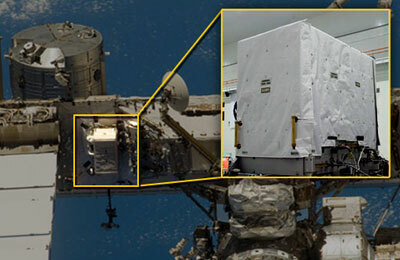 On STS-119 a jammed detent pin on the first of the systems prevented them from deploying the P1 system. A special tool was built to assist with the deployment. The STS-127 spacewalkers were successful in clearing the jam. Olivas and Fuglesang will have the same tool on hand for use if needed. If the detent pin does not jam, however, the cargo attachment system will be set up by removing brackets and pins holding it in place, moving it into its correct position and then reinstalling the brackets and pins. Once that's complete, Olivas and Fuglesang will work together to remove and replace a failed rate gyro assembly in the center of the station's truss. To remove the failed assembly, Olivas will disconnect two cables and remove two bolts. Fuglesang will remove the final two holding the assembly in place, and then Olivas will remove it and temporarily store it nearby. To install the new one, Olivas and Fuglesang will each drive four bolts, and Olivas will then connect its two cables before moving on to the next task. At this point in the spacewalk, Olivas and Fuglesang will split up. Olivas was scheduled to set up heater cables for Pressurized Mating Adapter 3 (PMA-3) between the Unity and coming Tranquility nodes, but an inspection of that berthing port during the mission's second spacewalk revealed a cable configuration different from what flight controllers expected, and so that activity has been deferred. Instead, Olivas will focus on the replacement of the first of two Global Positionining Satellite (GPS) antennas, while Fuglesang will replace a failed remote power control module on the center segment of the station's truss. To remove the failed module, he'll simply release one bolt. To install the new unit, he'll slide it into place on a guide rail and then secure it using one bolt. Fuglesang will then work on replacing the second GPS antenna. With those tasks done, Fuglesang and Olivas will come together again in the center of the truss to route avionics systems cables that will support the addition of Node 3 Tranquility, launching on STS-130. They will be using wire ties to secure two cable bundles to handrails along the truss system and Node 1 Unity, and then a panel on the truss. Olivas will wrap up the spacewalk by removing a damaged slidewire from a stanchion on Unity. Danny Olivas and Christer Fuglesang completed the third and final planned spacewalk for the STS-128 mission, their second together, at 10:40 p.m. CDT, seven hours and one minute after they began. The two spacewalkers deployed a payload attachment system on the station's truss, replaced two GPS antennas, a rate gyro assembly and a failed remote power control module and then worked together to run two 60-foot long avionics cables to support the upcoming arrival of Node 3 Tranquility. Olivas, working with one of the cables, ran into difficulty mating one of its several connectors. 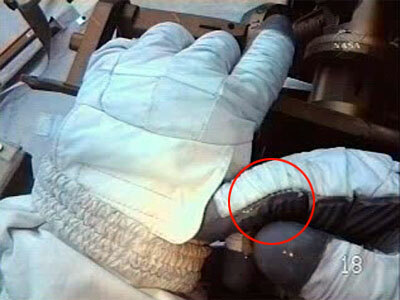 Ultimately, flight controllers decided to have Olivas secure the loose connector with an insulation blanket, leaving it to be dealt with on a future spacewalk. As Fuglesang was working on the other cable, his helmet's cover assembly, including its video camera and lights, became loose. With Olivas' help, the cover's power cable was detached and Fuglesang carried the assembly back to the airlock before an orbital sunset. Olivas completed the clean-up of their work area and then followed Fuglesang back inside. This was the 133rd spacewalk in support of space station assembly and maintenance, bringing the total time spent by astronauts and cosmonauts working outside the complex to 830 hours and 51 minutes. It was the 105th extravehicular activity (EVA) to originate from an ISS airlock, for a total of 643 hours and 36 minutes. Today's outing was both Olivas' and Fuglesang's fifth spacewalk each. Olivas now has career total of 34 hours and 28 minutes working in the vacuum of space. Fuglesang, as a Swedish astronaut flying for the European Space Agency, has logged 31 hours and 54 minutes, setting a record for an astronaut of other nationality than American or Russian. In total, astronauts Olivas, Fuglesang and Nicole Stott tallied 20 hours and 15 minutes over the course of the mission's three spacewalks. As Danny Olivas and Christer Fuglesang worked to finish all of the work outside the International Space Station planned for the STS-128 mission, their crewmates worked inside to continue cargo transfers and perform some needed station maintenance. Crew members replaced one of 16 common berthing mechanism bolts used to secure the Leonardo multi-purpose logistics module (MPLM) to the station. The bolt had not operated as expected early in the mission. The astronauts also opened an oxygen generation assembly water filter that was replaced before the shuttle arrived, and saw that it was 70 to 80 percent blocked. The inspection increases confidence that the filter replacement has restored the system to full functionality. The astronauts aboard the International Space Station and space shuttle Discovery turn their focus to final packing today. After nearly seven days of busy joint activities and three spacewalks, the shuttle crew will also get a half-day off. The crew awoke at 10:35 a.m. CDT to "Rocket" performed by Andrew Peterson. The song was played for Mission Specialist Pat Forrester. STS-128 commander Rick "CJ" Sturckow, pilot Kevin Ford, Forrester and mission specialists Jose Hernandez, Danny Olivas, Tim Kopra and Christer Fuglesang are slated to spend the morning packing up the Leonardo multi-purpose logistics module with supplies and equipment that will be returned to Earth. They will also install control panels on the Node 2 Harmony common berthing mechanism. Their station counterparts, commander Gennady Padalka and flight engineers Mike Barratt, Nicole Stott, Roman Romanenko, Robert Thirsk and Frank De Winne will assist with the transfer and perform station maintenance. Early in the crew day, Kopra and Olivas set aside time for media interviews from Texas and the military. At 12:54 p.m., they spoke with KFOX-TV, KXAN-TV and the Military Times. The 13 crew members on-board space shuttle Discovery and the International Space Station completed final transfer work between the two spacecraft Sunday in preparation for Monday's scheduled return of the Leonardo multi-purpose logistics module back to the orbiter's payload bay. With Leonardo packed with items for the return to Earth, the crew spent some free time together. Toward the end of their day, European Space Agency (ESA) astronauts Christer Fuglesang and Frank De Winne gathered in ESA's Columbus laboratory for a special event with representatives from Sweden. During the broadcast, they spoke with former ESA astronaut Jean François Clervoy, Lotta Bouvain of Swedish television, Swedish Minister for Education Jan Björklund, American Finnish journalist and talk show host Mark Levengood, and Swedish opera singer Malena Ernman. The STS-128 and ISS Expedition 20 crews are preparing to part ways, packing up their final items and closing the hatches that divide their two spacecraft in preparation for undocking tomorrow. The crew began their day at 10:30 a.m. CDT to the song "Only One," performed by Jeremy Kay and played for mission specialist Danny Olivas. The astronauts will close the hatch to the Leonardo multi-purpose logistics module (MPLM) and once configured, pilot Kevin Ford will join Hernandez to use the station's robotic arm to remove the moving van from its berth on the station and position it back in space shuttle Discovery's payload bay for its return to Earth. Mission specialist Jose Hernandez and flight engineer Nicole Stott will take questions from reporters at Telemundo, WTSP-TV in Florida, and Univision at 1:09 p.m. The Leonardo multi-purpose logistics module (MPLM) is now back inside Discovery’s payload bay and latched down for the ride home. Kevin Ford and Jose Hernandez used the space station's robotic arm to grapple the cargo carrier and remove it from its berth on Node 2 Harmony to then lower it into the orbiter for its return home. Packed inside Leonardo is 2,412 pounds of spent supplies, science equipment and refuse from aboard the International Space Station. With Leonardo in place, the seven STS-128 and six ISS Expedition 20 crew members gathered to bid farewell to each other before closing the hatches that separate their spacecraft. Mission specialist Tim Kopra said goodbye to his station crewmates after more than 50 days living and working on the outpost. Flight engineer Nicole Stott, who arrived aboard Discovery, will remain on station taking Kopra's place as an expedition crew member. Discovery is scheduled to undock from the space station at 2:26 p.m. CDT on Tuesday to begin the trip back to Earth. The astronauts and cosmonauts aboard the International Space Station and space shuttle Discovery have wrapped up their work in space together. The crews of the two spacecraft closed the hatches between them at 10:41 p.m. CDT on Monday. With eight days of joint operations between the spacecraft complete, Discovery is scheduled to undock from the ISS at 2:26 p.m. Tuesday. The seven astronauts aboard space shuttle Discovery awoke at 10:00 a.m. CDT, on the day when they will leave their neighbors for the past eight days and begin their journey home. 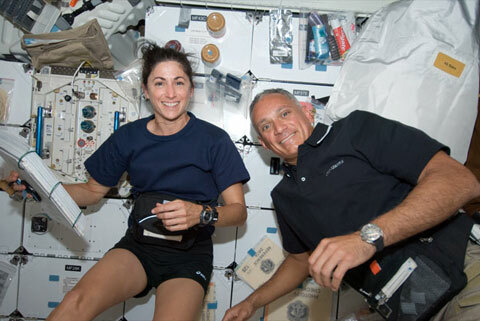 Setting the theme for the day was the wake-up song "Beautiful Day" by U2 played for Tim Kopra, who began this mission as a member of the International Space Station's Expedition 20 crew and ends as an STS-128 mission specialist, with Nicole Stott taking his place aboard the outpost. "It's indeed a beautiful day," replied Kopra, "we're happy to be here on Discovery." Kopra and his new Discovery's crewmates are set to undock at 2:26 and then perform a fly around of the station at 2:55 p.m. before setting out on a path that will lead them back to Earth on Thursday. With STS-128 pilot Kevin Ford at the controls, Discovery undocked from the International Space Station as scheduled at 2:26 p.m. CDT as the two spacecraft flew 223 statute miles above western China, near the border of Mongolia. The separation came after eight days, 19 hours and 32 minutes of joint operations between the orbiter and outpost. After backing Discovery to a distance of 400 feet away, Ford will perform a fly-around of the station. The three-quarter lap around the ISS will enable the shuttle crew members to survey and photograph the complex. After departing the vicinity of the International Space Station (ISS), Discovery's crew used their shuttle's robotic arm and its 50-foot long extension boom to examine the vehicle's heat shield one last time to survey for any micro-meteoroid damage suffered during the eight days they were docked with the outpost. The crew retired for the day at about 2 a.m. CDT on Wednesday.